Y'all know I tend to set plot points up in advance. Sometimes way, way in advance. I'll admit, part of that is because I play a long game, and part is for the fun of hiding little surprises for you. Now that Detonation Boulevard has been out for a few days, I can finally point out a tiny Easter egg I planted three years ago and have been waiting to unleash ever since. Don't worry, I'll keep it spoiler-free for people who haven't read it yet. In chapter 22, Freddie Vinter shows up and makes a surprising statement, referring to an event that couldn't possibly have happened. Or...did it? Once you've read that, pick up A Plain-Dealing Villain, and check out the first page of chapter 36. Look for a name. It's even in all-capital letters. Yes. Detonation Boulevard calls back to an event that was foreshadowed in January of 2015, because that's how I roll. I hope you're enjoying the book, or will be enjoying it soon! Now I've got to get back to work on Bring the Fire. Given how it's the final book of the trilogy, you can only imagine how many moving parts and plot lines I'm juggling, trying to wrap everything up in a satisfying bow. We'll see how it goes! It’s about seven hours ahead of the expected midnight launch, but this book just didn’t want to wait. Detonation Boulevard, the second book of the Wisdom’s Grave trilogy, is available now! You can grab the e-book version at Amazon now, and the paperback version should be available by this weekend. Meanwhile, Susannah Jones will be in the recording studio at the end of the month to perform the audiobook version. What can you expect from this book? A doomed love affair, fast cars, explosions, interdimensional travel, a demon singing the blues, kissing, deeply improper uses of occult tools, and a shopping mall that isn’t quite right. And some other stuff. It’s a long story. Meanwhile, I’m hard at work on Bring the Fire, the third and final book. I’ll be honest, this is scary. The Wisdom’s Grave trilogy is the biggest story I’ve ever written, in terms of scope and impact. It’s a personal story, where I have to put a lot of myself on the page, and it’s thematically about some concepts that are really important to me. So of course, I’m worried I’m going to botch the third book and screw it all up. That said, the outline is holding up, and the work will get done. After that I’ll be turning my sights to the return of Harmony Black, though I don’t have a release window beyond “sometime in 2019.” And needless to say (but I’m saying it anyway), Daniel Faust will be returning as well. So, that’s that. The book is out, and I really hope you enjoy it. I’ll be over in my office, pacing, nervous. What’s good for opening-night jitters? Wine, right? Wine sounds good right about now. Happy Friday, everybody! I thought today would be a good time to update you on what I've been working on -- and to show off the snazzy new cover for Detonation Boulevard! The book is finished, it's in my editor's capable hands, and we're plugging away at polishing it up for release. Right now we're aiming for a release in early August; it's going to depend on how deep the revisions go but I'm pretty confident we'll hit the target. It's not up for pre-order yet, but I'll let you know when it is. To have any hope of finding Wisdom's Grave -- and escaping their eternal curse -- Nessa and Marie have to cross over two thousand miles of hostile territory. Their enemies have political power and an army of ruthless bounty hunters. They have a book of black magic, a gun, and a Cadillac Eldorado. It's not a remotely fair fight, and I haven't even mentioned the inter-dimensional portals. Or the veiled murder-cultists. Or the return of some old enemies (and friends). Let's just say that large chunks of the American heartland may never be the same. Meanwhile, no days off for yours truly; I'm already working away on book three of the trilogy, which now has an official name: Bring the Fire. I don't want to keep you waiting for too long, because...well, Detonation Boulevard doesn't end on an abrupt cliffhanger, as such (I wouldn't do that to you), but it is the middle book of a trilogy -- and as the captive storyteller Carolyn explains to her interrogator, trilogies have rules. If I don't take you on an emotional roller-coaster with this one, I'm not doing my job right. So that's it from me, time to get back to it. Have a great weekend! The Neon Boneyard: Now in Audio! Meanwhile, I've just come back from a weekend trip to NYC, for field research on an upcoming book and to see the first staged reading of the new musical Bisland & Bly, from my friends in the Sycamore Theatre Co. -- lemme tell ya, folks, this play is going to be big. And as always, spending time with artists making great art leaves me feeling super-charged and ready to up my game. I'm in the homecoming stretch of the first draft of Detonation Boulevard, dropping plot bombs and bringing back some old familiar faces. And I'm nowhere near quitting time, so I'd better get off social media and back to my word processor. Talk to you soon! Good morning, all! 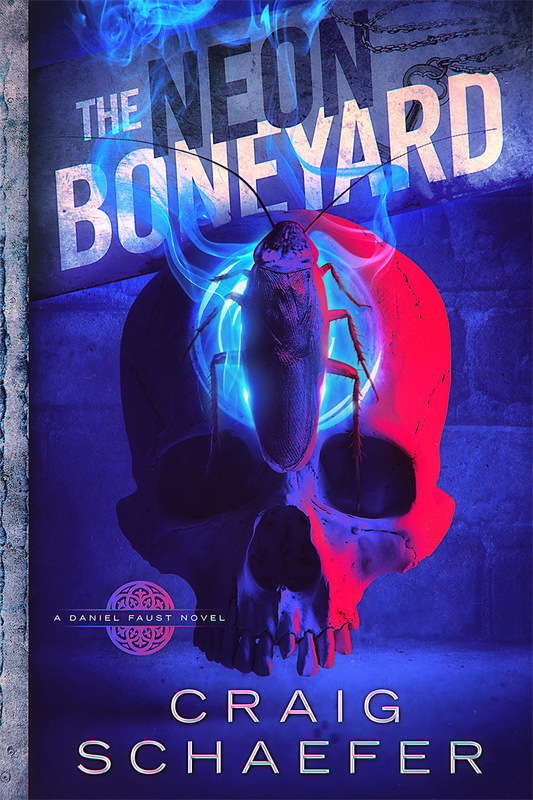 Just a quick note to let you know that the new Daniel Faust novel, The Neon Boneyard, is now available. You can grab it in e-book or paperback on Amazon, and the audio version will be coming in a few weeks (as Adam Verner, our narrator, is in high demand as always). This book marks a few fun milestones. It's the first novel I've ever had to finalize in the middle of a cross-country move (an experience I wouldn't recommend to anyone), and the first time I've felt the need to apologize to my editor in advance, for making her read one particular scene. You'll know it when you get there. The Neon Boneyard: Cover Reveal! "Daniel Faust has clawed his way from the gutter to a penthouse suite, carving a bloody swath across the Las Vegas underworld. He's buried his enemies and more than a few friends along the way. If there's one thing a modern-day sorcerer knows for certain, though, it's that the past never stays buried forever. "Now he's running on ice, juggling his responsibilities as a mob boss with his dubious "gift" of a knighthood in the courts of hell, defending territory in two worlds at once. It's a bad time for unfinished business to come back and haunt him, forcing him to confront his tortured history and the family he left behind. An even worse time for his surviving foes to join forces and take deadly aim at Faust's throne. "Toss in a syndicate operative from a parallel world, a deranged half-demon assassin hungry for a duel, and the shadowy machinations of the King of Worms, and the stage is set for a showdown under the neon lights of Vegas. Vultures are circling, and only the magician with the quickest wits -- and the fastest trigger-finger -- will survive." And that's all I've got to say for now! Be safe, have fun, and I'll catch you on Tuesday. Sworn to the Night: Now on Audio! Hey, everybody! Well, I made it to North Carolina. My furniture hasn't, yet, and won't be here until Saturday, but otherwise I'm loving the new place. And most importantly, I'm back to work. The endless distractions of the house sale and move are finally over (except for the furniture thing), and I'm finding my stride again. Also, the new place has twelve-foot ceilings and acoustics that do amazing things with the clacking of my mechanical keyboard. I'm easily amused. Beyond that, I'm thrilled to announce that the audiobook version of Sworn to the Night, narrated by the fantastic Susannah Jones, has finally been approved by Audible and is available for sale. I'm so happy with how this turned out, and I hope my audiobook fans will be as thrilled as I am! Meanwhile, my editor should be done with the manuscript for The Neon Boneyard in another week or so, and I'm ready to raft through an ocean of red text. Editing is never fun, but always worth it in the end. Well, I’m three days from my move to North Carolina. My computer is propped up on a box. I’m sitting on a box. The house is boxes. Last month I had an amazing, revitalizing trip to New York, attending an artists’ salon held by the Sycamore Theatre Company, and it left me itching to create big things…which is hard, when your house is boxes. There comes a point, preparing for a cross-country move, when even the simple day-to-day business of life demands ridiculous mental exertion. Total burnout. But it’s almost over, and soon I’ll be ensconced in my new WriterNest. Let’s talk about some short-term business first: The Neon Boneyard has an official release date, April 10. I’ll try to get a pre-order page up around the first of the month, once we’re closer to finished with the editing. Adam Verner is on board for the audiobook version, and he’ll be recording in early May. Speaking of audiobooks, I’ve finished reviewing the files for the audio version of Sworn to the Night and it’s fantastic. I mean, the words are okay, but Susannah Jones’s narration is fantastic. That’s currently under review at Audible, so it could launch any time between tonight and next week (we never really know how long it’ll take). I’ll put up an announcement when it goes live. And after that? As I mentioned last update, in 2019, 47North will be publishing my novel Haunted Palaces. This isn’t a new series; it’s a big brick of a book, and a one-and-done, self-contained story. It’s also not connected to the Faust-universe novels. Writing this thing was a tremendous experience, both from the perspective of trying something risky and new, and creating a one-shot story that wraps up clean in a single book. I’ll be sharing some thoughts about that, down the pike, once I’ve finished processing them. And you know me, I’ve always got to be trying new things in the hopes of improving my craft. I can now announce that I’ve signed a contract with Thomas and Mercer Publishing for a brand new series that will also be kicking off in 2019. All I can tell you right now is that it’s a crime-thriller series with no fantasy elements, existing in its own continuity. I’m really excited to see how it’ll be received, and where we can go from here; I love weaving fantasy and horror elements in my work, but I grew up reading Elmore Leonard and Lawrence Block, so it’s been a heck of a thrill to finally work in their wheelhouse. 47North has canceled the Harmony Black series. Long story short, many publishers base a series on preorders even more than live sales, and fewer people were preordering each new installment. They still sell great, as far as I’m concerned – but for me, “great” means my rent is paid, so there’s a certain difference of scale involved. This isn’t the end of my relationship with them (like I said above, they’re backing Haunted Palaces, and we’re talking about some other projects). It is also not the end of Harmony. Way back when, I made a promise to you all: I never start a story without finishing it. I know it’s popular to say writers don’t “owe” their readers anything, and I don’t have any beef with people who feel that way, but for me, it’s not true. If I start a story, I do owe you an ending. And because my publishers are awesome people, I can make that happen. I’ve got the green light to take the series over and self-publish the continuation. They’ll still own and publish the first four volumes, and anything after that is in my hands. So here’s the bottom line: I am committing, here and now, to writing three more books in the Harmony Black series and paying for it out of my own pocket. I’m early in outlining, but the plan is that they’ll form a trilogy of sorts, culminating in what I hope will be a satisfying conclusion. Will there be anything after that? Right now, I can’t say – my crystal ball doesn’t stretch that far. But there will be at least three more books, with a big finish. Because of the changeover, I want you to be aware of a few things up front. The first four Harmony covers were done in-house by my publisher, so I’m on my own there. I’m hoping James Egan, the fantastic artist who does the Faust and Wisdom’s Grave covers, will be on board for the project, and we’ll come up with something super-cool. They’re going to look different, though, and if you collect the paperbacks, the spines won’t look the same. (I will make sure the paperbacks are printed in the exact same size as the current ones, though, so they’ll at least line up neatly on a shelf). Like the art, the audiobook narrator’s deal was with the publisher, not with me (and there are some middlemen involved, it’s all complicated inside-baseball stuff). Bottom line is – and I apologize, I know how many audiobook fans hate when this happens – we’ll be switching narrators. I’ve asked Susannah Jones to step up and take the wheel; given her amazing work on the Revanche Cycle and Wisdom’s Grave adaptations, I’m confident she’s going to do an incredible job. All I ask is that you give her a chance, and I think you’ll really be pleased. File this under “maybe.” Now that I have 100% control over the franchise, I’m looking at the first four books and doing a post-mortem of what I did right, what I did wrong, what I wanted to do but couldn’t, what I was asked to do by the publisher, and so on. I’m mulling some changes to really make these follow-ups fire on all cylinders. One thing I’m contemplating is a shift from first to third person. There are a few reasons for that. For one, I think I can do a better job portraying Harmony herself from outside her head. She’s not neurotypical, and my attempts at capturing that from inside her own thoughts have been…eh, clumsy, by my estimation, though I’ve got a better grip on who she is now. Thought it may seem counter-intuitive, I suspect I can get you closer to her from a small distance. Secondly, it’s due to the structure of the series. The Faust books are first-person because I’m mining the traditions of pulp fiction and noir detective novels (just don’t call Daniel a ‘magic detective’, he hates that). Back in 2015 I made the choice to write the Harmony series the same way, since it’s a companion series set in the same world….and that was a mistake. What I didn’t realize at the time was that the Harmony series is drawing more from technothrillers and spy novels, and first-person wasn’t the right tool for the job. Basically, tying the entire story to Harmony’s perspective, when she’s part of an entire team of specialists, was like writing with handcuffs on. Can I split Harmony and Jessie up as part of a mission? Nope, not unless I want to cut out whatever Jessie is up to. And that’s to say nothing of bringing April and Kevin into the field simply because otherwise they’d only appear on the other end of phone conversations. With a third-person perspective, I can move the camera around. I can show you the cool science stuff April and Kevin are doing back at base, without pulling them into the line of fire for arbitrary reasons (one of the biggest complaints I get about the series). I can send Harmony and Jessie on a high-stakes operation where they have to momentarily split up or cover each other from a distance. I can zoom in on the bad guys now and then, outside of the usual prologue/epilogue bits, and capture more of the world. I can even show you what the team members are up to when they’re not on the job. So that’s a little of what I’m thinking about. Trying some things, taking some risks, aiming to tell better stories. The real bottom-line takeaway from this is that there will be more Harmony books, and I’m going to do my best to kick it up a notch. Okay, that’s enough from me, I’m going to go and find some dinner because my fridge has been cleaned out and everything in my kitchen is taped up in boxes. My house is boxes, did I mention that?